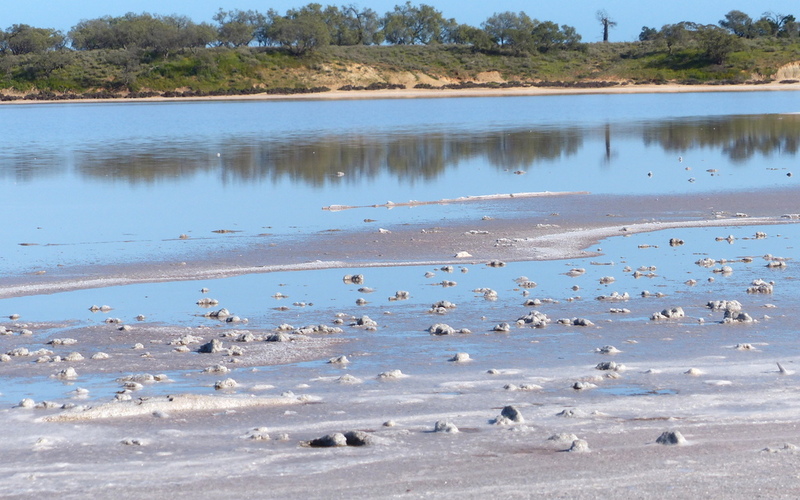 It was only a short drive from Hattah-Kulkyne to the Pink Lakes in the Murray-Sunset N.P. – we had time to buy a few provisions and still be set up in a new camp in the early afternoon. As we drove along Pink Lakes road White Chats dashed out in front of us so we enjoyed their company for a moment before we each continued on our separate ways. The Pink Lakes are quite extraordinary, although the colour of the water does vary considerably depending on the weather conditions, we were lucky enough to see them looking quite pink……its a challenge to capture it and I have resisted any temptation to ‘enhance’ the pink hues in the photograph. 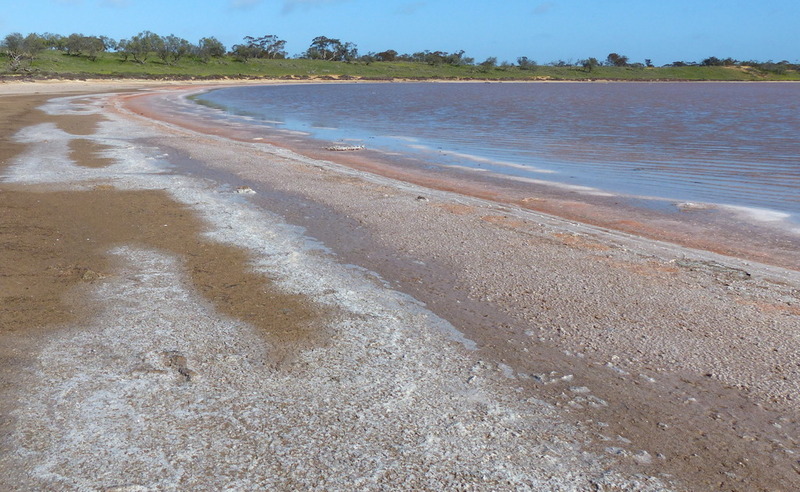 An incredible 800 times saltier than sea water means that as the water evaporates salt crystals form on the surface of the lake – the salt from Pink Lakes has been tested as 99% pure and salt was commercially harvested from 1916 to 1979. Much of the work was done by hand with the workers shovelling the salt into wheelbarrows which were then pushed across planks to the shore. 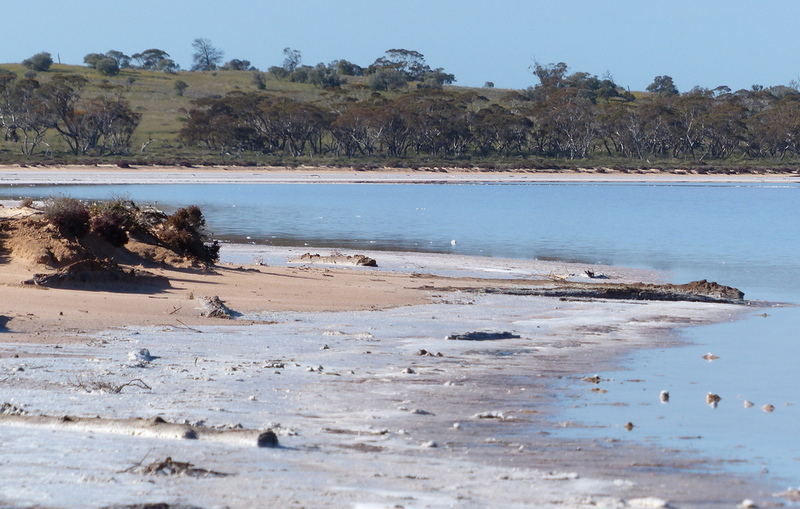 Hard labour indeed with the Mallee summer sun reflecting on the white surface of the lake and temperatures frequently over 40 degrees. Dunaliella salina, a microscopic, single-celled alga, is one of the very few things that can live in this extremely salty water. 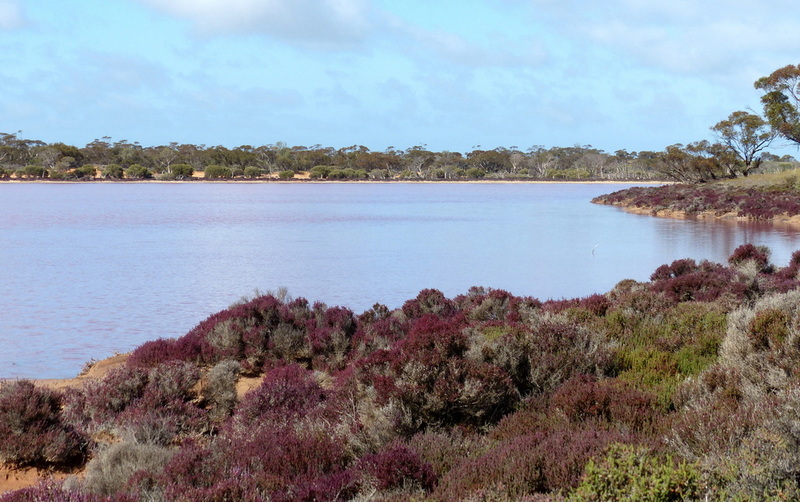 This alga, which flourishes under warm conditions, secretes beta-carotene the red pigment which gives carrots, oranges and egg yolks their colour and casts a pink glow across the lakes. Plant species must be highly specialized to survive in this extreme environment; they need to be able to cope with the high salt levels as well as with a lack of water and vital nutrients like nitrogen. Chenopodiaceae is a widely represented plant family in these conditions, this Tecticornia is one which has the ability to take advantage of the beta-carotene as a food resource and an aid to photosynthesis. On our last day at the Mt Crozier camp there was a tremendous storm during the afternoon and into the evening, bringing very strong winds and some rain. It had blown over by the next morning for which we were very grateful as it is always much easier packing up camp in fine weather. Our way out of Murray-Sunset took us past the lakes again, it was fascinating to see quite a wide rim of salt along the shoreline glittering in the morning sun. The storm would have been spectacular to witness down by the lake with the wind whipping across the water but for us it was quite enough just to see its effects.